The charming animated film, winner of the César Award for the best animated feature, “The Rabbi’s Cat,” is based on the “The Rabbi’s Cat” comic novels by Joann Sfar (“Little Vampire” comic novel and the film “Gainsborough”). It is an imaginative and artistic work about a family in 1920s-1930s Algeria—the 60 year old widowed Rabbi Sfar (Maurice Benichou-voice), his fetching daughter Zlabya (Hafsia Herzi-voice) their annoying squawky parrot (Olivier Broche-voice) and their super- intelligent cat (Francois Morel-voice). Soon the cat grows weary of the parrot’s constant screeching and eats the parrot. Miraculously, the cat has the gift of speech, but lies about killing the bird. The cat is now a philosopher overflowing with derisive humor, irony and occasionally, a rare gentleness. It is possible to find the cat as annoying as the parrot, but stay with the film. With his newfound language, the cat begins to question whether he is Jewish like the rabbi. The rabbi tries to keep the cat on the straight and narrow by teaching him the Torah, but the cat is adamant about studying the kabbalah and having a Bar Mitzvah instead. The first half of the film highlights the peaceful coexistence among Jew, Muslims, Christians and the French at the time. Sfar has captured the music and textures to create an enthralling portrait of the citizenry and their surroundings. Apparently, Sfar was inspired by his Jewish heritage to write the comic novels and bring them to film. In the rather disjointed second half of “The Rabbi’s Cat,” the family finds a handsome Russian Jew hidden in a shipping crate. His dream is to find a mythical Jerusalem populated by black Jews. The rabbi and his cat follow him across Africa to find the African Jews of Ethiopia. A distant cousin who is a Muslim scholar helps them on their journey. 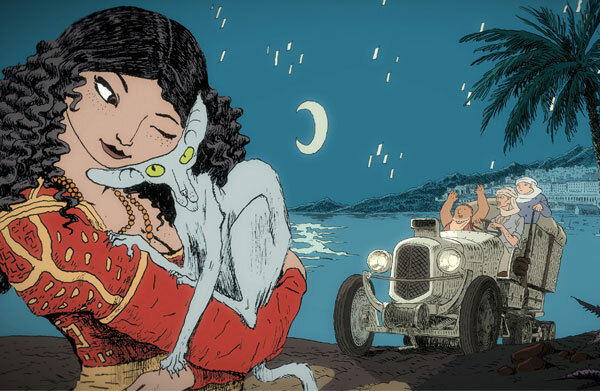 Many new characters are introduced along the road, such as an unfriendly Arabic Sheik (Mathieu Amalric), an African girl and a cameo appearance by Tintin and his dog Snowy. The party faces danger as they travel through the Saharan desert with its brilliant night skies and the dark and scary jungles of Africa all the way to Ethiopia. “The Rabbi’s Cat” has exquisite hand-drawn animation with deep rich colors that give it a flowing sense of movement. This mirrors the author’s original comic style and suits the tempo of the story. Quite simply, the animation is beautiful to watch. It’s filled with detail although its look is disarmingly simple. The cat is drawn with elongated facial features and an uncharacteristically long tail – not cute and cuddly. “The Rabbi’s Cat” is available in 2-D and 3-D versions. I viewed the 2-D version and didn’t miss the 3-D. The film is entertaining and accessible, with some mature views of belief systems, philosophy and racism. At first blush, sections of the film may seem esoteric absent a brief awareness of Jewish and Algerian society in the 1920s-1930s. Nevertheless, “The Rabbi’s Cat” should appeal to broad audiences. Sfar’s enchanting portrait of a society in which Jews and Muslims live compatibly is a lesson for our time.